A brief foray into the formal characteristics of contemporary popular music is used to launch this lecture on musical form. 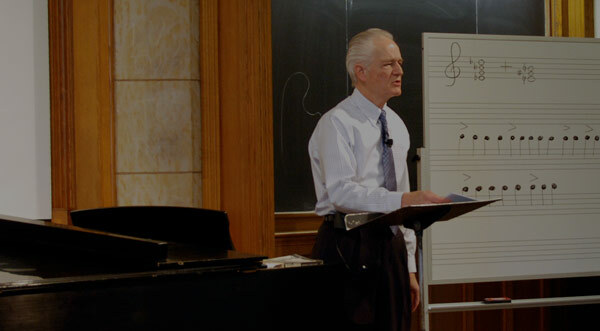 After a discussion of the “verse-chorus” form often used in popular music, Professor Wright proceeds to take students into the realm of classical music, focusing particularly on ternary form and sonata-allegro form. Throughout his detailed explanation of sonata-allegro form, he also elaborates upon some harmonic concepts describing, for example, the relationship between relative major and minor keys. This lecture draws its musical examples from ‘N Sync, Mozart, and Beethoven. The Sonata-Allegro Form in Mozart's "A Little Night Music"
Professor Craig Wright: Okay. Let us start, ladies and gentlemen. We’re going to pursue the issue of musical form today. It’s an important thing to talk about because it allows us to follow a particular piece of music, and we’ll be — I am using this metaphor of a musical journey and wanting to know where we are in music throughout the day today. Form is particularly important in all types of music — popular music as well as classical music — and we have this complex of material coming at us, this sonic material. And we try to make sense of it, and we say that it has a particular form. And we say it could have a particular structure even, so we tend to use metaphors having to do with architecture and things such as this. What we are really doing here is taking all of this sonic information that’s coming into our brain and getting sorted, and makes us want to dance around or clap or be sad or happy, and make sense of it in terms of a few rather simple patterns. And musicians like to have forms because oftentimes it tells them what they ought to do next and where — here — I’m here but what ought to happen next? Well, if you’ve got a tried and true musical form that other musicians have used over the years, you might be inclined to use it too because your know your listener will be able to follow you. Now the other day, I asked early on in the course about the form in popular music, and I threw this out not really knowing what the answer would be. What’s the most common form that one encounters when dealing with pop songs? And for the most part there was silence across the room, but one student — I have tracked him down — Frederick Evans, gave a very good answer — really a better answer than I could have given. So, clearly Frederick knew something about this idea of what he I think referred to as “verse and chorus” structure. I might call it “strophe and refrain,” but it’s the same thing whether you have it in a Lied of Franz Schubert or in a piece that I know nothing about. And Frederick is going to show us — introduce us — to a piece that I know nothing about. I sent him an e-mail last night saying, “Frederick, you gave a really good answer. Why don’t you pick a piece, come up and demonstrate this?” So this is Frederick Evans. We’re going — or excuse me. Yeah, Frederick Evans. He’s going to come up here. I’m told we have to give him a microphone and he is going to introduce us to this particular piece. Now you probably all know what this piece is. How many of you have heard the piece we were just listening to? Everybody knows it. Who is the one person in the room that’s never heard this piece before — has no clue what’s happening? Moi. Okay? So Frederick, tell me about this piece, please. Frederick Evans: All right. This is a piece by ‘N Sync — back when I was in fifth grade — and it’s “Bye Bye Bye,” and the pattern that it follows is really the archetype of a lot of popular songs. It’s half of the chorus or so when it starts and then there’s verse, chorus, verse, chorus and then what I call the bridge, which is like an emotional climax. And then the last one is a really powerful chorus where they just bring it home and then the music fades away. Professor Craig Wright: Okay. So it’s this idea of changing text, then coming back to familiar text and familiar music, then changing, going back to the familiar new text, and then coming back to the familiar in terms of the chorus. Is that a fair shake? Frederick Evans: Yes, Sir. Yes. Professor Craig Wright: Okay. So shall we play — what are we going to hear first? Frederick Evans: So first you’ll hear from seconds twenty-four to forty. This is an example of the verse where they have the beginning of the plot and then you have the chorus at seconds — about fifty-six — and that’s where you get your repeating idea, which is what the piece is based on. And then last but not least, you have the emotional buildup where the background and the chord progression changes, a little more solemnly, and then there’s the last chorus that just brings it home. Professor Craig Wright: Okay. Great. Let’s listen to the-yeah. [music plays] Okay. Frederick Evans: Yep. So that was the first verse and that’s when they really get you into what they’re talking about. Professor Craig Wright: What really interests me here is what they’re using is a baroque ostinato “Lament bass” but that’s — we’ll get on to that in another week or so. So that’s — okay. Now we’ll go to the bridge, Frederick? Professor Craig Wright: Okay. That’s wonderful. Thank you, Frederick. That’s exactly what I wanted. [laughs] [applause] Okay. How many want Craig to continue teaching this course and how many want Frederick? Let’s hear it for Craig. [laughter] Let’s hear it for Frederick. [applause] I knew it. Okay, but that’s a good way of getting introduced to the idea of musical form. Let’s talk about form now in classical music. The forms are a little more difficult in classical music because the music is more complex. And before we launch into a discussion of these musical forms, I want to talk about the distinction of genre in music and form in music. So we’re going to go over to the board over here and you can see that I’ve listed the standard classical genres. What do we mean by genre in music? Well, simply musical type. So we’ve got this type called a symphony and this type of music called a string quartet and concerto, and so on. We could add other types: ballet, opera, things such as that. In the popular realm we’ve got genres too. We’ve got — classical New Orleans jazz would be a genre. Blues would be a genre. Grunge rock would be another sort of genre. A genre presupposes a particular performing force, a particular length of pieces and even dress and mode of behavior of the auditors — the listeners. If we were going to listen to the genre of a symphony, we would dress up one particular way, go to Woolsey Hall and expect to be there from eight o’clock until ten o’clock. If you were going to hear the Rolling Stones play at Toad’s — where they do play occasionally — obviously one would not come at eight o’clock. One would come later, and one would dress in a particular sort of way and one would behave, presumably, in a different sort of way. So that’s what we mean by genre, a kind of general type of music. Now today we’ll start to talk about form in music, and what I need to say here is that each of these genres is made up of a — of movements, and each of the movements is informed by a particular form. So with the symphony we have four movements there: fast, slow, then either a minuet or a scherzo, and a final, fast movement, and each of these movements can be in one of the number of different forms and we’ll talk about what they are in just a moment. So when we come to the string quartet, same sort of thing: fast, slow, minuet, scherzo, fast. Any one of those can be in a particular form. Concerto, generally, as mentioned before, has just three movements and sonata, a piano sonata, something played on a piano, or a violin sonata with violin and piano accompaniment — they generally have just three movements: fast, slow, fast. Okay. Let’s talk about our forms now. In classical music things go by very quickly and it’s difficult to kind of get a handle on it, and we, generally in life, don’t like to be lost. We like to know where we are, we like to know what is happening, and this is what form allows us to do. So that if we’re hearing a piece of music and all this stuff is coming at us we want to make sense of it by knowing approximately where we are. Am I still toward the beginning? Am I in the middle of this thing? Am I getting anywhere near the end of it? How should I respond at this particular point? Well, if we have in mind what I’ve identified here, we will be referring to as our six formal types, and we can think of these as templates that, when we’re hearing a piece of music we make an educated decision about which formal type is in play. And then we drop down the model of this formal type, or the template of this formal type, and we sort of filter our listening experience through this template, or through this model. So here are our six models: ternary form, sonata allegro form, theme and variations, rondo, fugue, and ostinato. And they developed at various times in the history of music. Theme and variations is very old. Sonata-allegro is a lot more recent. Now of these, the ones that we’ll be working with today are ternary form and sonata-allegro form, and sonata-allegro is the hardest, the most complex, the most difficult of all of these forms. It’s so-called because it usually shows up in the first movement of a sonata, concerto, string quartet, symphony, so — and the first movements are fast so that’s why we have allegro out there, and it most is associated with this idea of the sonata. It didn’t necessarily originate there. It originated there and in the symphony, but for historical reasons we call this sonata because of its association with the sonata and the fact that it goes — and the fact that it goes fast — sonata-allegro form. So that in a symphony, usually your very first movement will be in sonata-allegro form. Your slow movement, well, that could be in theme and variations; it could be in rondo; it could be in ternary form. Your minuet and scherzo is almost always in ternary form and your last fast movement could be in sonata-allegro form. It could also be in theme and variations; could be in rondo; could be in fugue. Sometimes it’s even in ostinato form. So you can see that these forms can show up and control — regulate — what happens inside of each of these movements. Okay? Are there questions about that? Does that seem straightforward enough? We have a big picture of genre here, movements within genre, and then forms informing each of the movements. Yes. Student: Did you say that the ternary form is normally used for the second movement? Professor Craig Wright: No. I said it’s possible that it is — could be — used for the second movement. A ternary form is one of the forms that could be used with the slow second movement. We could also have theme and variations. We’re going to hear one of those later in our course. It could also be a sort of slow rondo. So it’s just one of really three possibilities there, but thanks for that question. Anything else? Okay. If not, let’s talk then about ternary form because ternary form has much in common with what we experience in sonata-allegro form. Let me take a very straightforward example of ternary form. It’s from Beethoven’s “Für Elise,” the piece — the piano piece that Beethoven wrote for one of his paramours at one time or another. Here. I’m going to tell you a story about this. My cell phone broke the other day. My cell phone broke the other day so I had to buy a new one. I was really happy about that. I hated to lose my old Mozart theme, but I then had to find a new Mozart theme. And nowadays my selections are more limited. So when you go on to these things — and in truth, I actually had my youngest son do this because I’m hopelessly incompetent with this kind of thing — you go on to these things, and now they only have one option for classical music, one option for — but it’s called “Mozart” so good choice. Mozart has become the icon of classical music and I think it’s the individual that should be the icon for classical music. All classical music now has been reduced down to just Mozart. Okay. I have no idea what that was about, but, well, who’s calling? All right. So we have this piece in ternary form by Beethoven, and ternary form is — conveys to us simply the idea of presentation, diversion, re-presentation or statement, digression, restatement — anything like this. We like to diagram these in terms of alphabetical letters. You can think just A, B, A. [plays piano] All right. I’m going to pause here. We started out here. [plays piano] We are in this key. Major or minor? What do you think? Minor. All right. So were coming to the end of this A section. Here — The A section is very short [plays piano] but then [plays piano] we — major or minor? Major. Right. [plays piano] So what happened there? What do we call this? [plays piano] It’s a very quick modulation. We’ve changed keys. And I’m going to digress here just for a moment to talk about this, which is this concept of relative major and minor. You may have noticed in music — and it’s discussed briefly in the textbook — that there are pairs of keys, pairs of keys that have something in common. The members of the pairs have the same key signature, and we could take any key signature — three flats or two sharps, whatever — but there’s going to be one major key with three flats and one minor key with three flats. And I think we have up on the board here an example of just that so you can see written in here the three flats, and this is a minor scale with three flats. Now we could also have three flats over here, but we encounter three flats where we have the major scale. This happens to work out so that it’s pitched on C. If we come up three half steps in the keyboard, we come up to E-flat so the relative major — the major key in this pair — is always three half steps — [plays piano] one, two, three — three half steps up above its paired minor. Here’s another one down at the bottom — happens to have one sharp in it. We have the key of G major here with one sharp but if we come down three half steps [plays piano] we get its relative minor down here, and the reason I mentioned this is not because we actually hear this very much. I’m not sure that I hear modulations to relative major because I don’t have absolute pitch and I’m not tracking keys when I listen to pieces — and my guess is you’re not either. So for the average listener, we may not hear the actual pitch relationship but we may hear that we’ve had a modulation and you can kind of make an educated guess: that about fifty percent of the time if it’s going minor to major, it’s coming in this relative arrangement — where major down to minor; it’s going in this relative arrangement, so this happens a lot. So here we are in the mid section of our ternary form, A B A. Here’s the B part [plays piano] and then back to [plays piano] the minor A. [plays piano] Now that’s just the opening section of this piece. It goes on to do other things, but it’s a very succinct example of ternary form, and ternary form is a useful way of introducing a larger concept, which is sonata-allegro form. So let me flip the board here, and here we go on to this rather complex diagram. As I say, it’s the most complex one of all the six forms that we’ll be working with. It consists of three essential parts: exposition, development and recapitulation. So you could think you were coming out of ternary form. You’ve got an A here, you’ve got a B idea here and then you’ve got an A return back here — but this is a lot more complicated. There are things — lots of things — going on. And I should say also — in terms of fairness in advertising — that this is a model. This is also something of an abstraction or an ideal. Not every piece written in sonata-allegro form conforms to this diagram in all particulars. Composers wouldn’t want to do that — they’d have to assert their independence or originality in one way or another — but it’s a useful sort of model. It tells us what the norm is, what we can generally expect. So we’ve got these three sort of sine qua non here and then we’ve got two optional parts of this that we’ll talk about as we proceed. So this is the way we set out then sonata-allegro form: exposition, development, recapitulation. So we start out with the first theme, in the tonic key of course. It might even have subsets to it so that we could have one A and one B and one C up here. I won’t put them up there but it can happen. Then we have a transition in which we have a change of key, moving to the dominant key. Transitions tend to be rather unsettled. It gives you the sense of moving somewhere, going somewhere. That’s why it’s called a transition. It could also — musicians like — quickly — like to call it a “bridge.” It’s sort of leading you somewhere else — and maybe in that way it is similar to the type of bridge that Frederick was talking about earlier. So we have a transition or bridge that takes us to a second theme in — now in the dominant key. If, however, our symphony happened to begin in a minor key, then the second theme would come in in the relative major. So if we had C minor as Beethoven does in his Fifth Symphony — [plays piano] So there we are there in C minor, but the second theme [plays piano] is in the relative major of E-flat. Both have three flats in it. So if you have the start in minor, then composers traditionally modulate, not to the dominant, but to the relative major — which is up on the third degree of the scale. That’s why there’s a big three (III) there. So then the second theme comes in. It’s usually contrasting, lyrical, sweeter. You heard the difference there — more song-like in the Beethoven — not so much of that musical punch in the nose as I like to refer to it, but a more relaxed sort of second theme, and there is oftentimes some filler or what we might call an interstice and we come to a closing theme. That’s abbreviated up here, just CT, closing theme of the exposition, closes the exposition. Closing themes tend to be rather simple in which they rock back and forth between dominant and tonic so that you could end on the tonic and that gives you a sense of conclusion of the exposition. Now what happens? Well, you see these dots up on the board. Anybody know what these dots mean? I think we — actually we talk about this if you read ahead in the textbook Can somebody tell me what the dots mean? Jerry? Professor Craig Wright: Okay. Repeat. Okay. So that’s what dots in music do — when we have these double bars and dots that means repeat so we got to repeat the whole exposition. If we didn’t like it the first time, we get a second pass at it in the repeat. Then we go on to the development and as the term “development” suggests, we’re going to develop the theme here, but it is oftentimes more than that. It could be something other than just the development and the expansion. It could actually be a contraction. Beethoven likes to strip away things and sort of play with particular subsets of themes or play with parts of motives. Generally speaking, your development is characterized by tonal instability — moves around a lot. You can’t tell what key you’re in — tonal instability — and it also tends to be, in terms of texture, the most polyphonic of any section in the piece. There’s a lot of counterpoint usually to be found in the development section. Then towards the end of the development section we want to get back here to the return and we want to get back to our first theme and our tonic key. So composers oftentimes will sit on one chord. What they will sit on will happen to be the dominant. So I could put that up here. We could put a five (V) up here because we want a long period of dominant preparation. [sings] is where we’re going, back over here. But we’re going to set this up as preparation in terms of the dominant that wants to push us in to the tonic. So there we are back in the tonic now and all the first themes come back as they did before. We also have a bridge but this time it does not modulate. It stays in the tonic key. We don’t want it to modulate because we’ve got to finish in the tonic here. So I was thinking just a moment ago it’s kind of the “bridge to nowhere.” It really is a bridge to nowhere. You go right back to where you were. You stay in that tonic key and the second theme material comes in, your closing theme comes in, and you could end the composition here. Sometimes Mozart as we will see in our course will end a piece right at this point — the end, right there — but more often than not composers will throw on a coda. What’s a coda do? Well, it really says to the listener that “hey, the piece is sort of at an end here.” Codas generally are very static harmonically. They’re — there’s not a lot of movement. It’s — and I keep — maybe I should have got — come up a different metaphor here — the idea of throwing an anchor over, slowing the whole thing down, simplifying it to say we’re at the end. So you get a lot of the [sings] kind of things in the coda just to tell the listener it’s time to think about clapping at this point, or reaching for your coat. And the other optional — Coda — What’s that come from? The Latin cauda (caudae) I guess. . Italian coda means tail, and these can be, like all tails, long or short. Mozart happened to like short codas. Beethoven liked longer codas. And the other optional component here is the introduction. My guess is — Jacob, what would you guess? How many — what portion of classical symphonies — you’re an orchestral player — what portion of classical symphonies would begin with an introduction, would you say? Professor Craig Wright: Most of them? Well, we’ll consider that. Let’s go for fifty percent at the moment. We’ll consider fifty percent at the moment, so we’ll see. Now let’s jump into a classical composition that begins with a movement in sonata-allegro form. We’re going to open here with Mozart’s “Eine kleine Nachtmusik,” “A Little Night Music.” This is sort of serenade stuff that he wrote for Vienna — sort of night music, evening music. Let’s listen to a little of it. We’re going to start with the first theme idea, and before she does let me play this. [plays piano] What about that? Conjunct or disjunct melody? Professor Craig Wright: Disjunct, yeah. There’s a lot of jumping around [plays piano] and that kind of thing. Notice it’s mostly [plays piano] just a major triad with [plays piano] underneath. So if we were at a concert and we wanted to remember this, we’d probably have a lot of skippy Xs here. We don’t have time to get into the particulars of this, but that’s why we’re doing all of this diagramming stuff. So we got a lot of these skipping Xs. What’s the most noteworthy aspect of that theme? [sings] What do you think? Thoughts — what would you remember about that? How would you graph that? Yeah. Professor Craig Wright: Okay. Yeah. It starts out [plays piano] and then it’s really conjunct, right, because it’s staying on one pitch level, sort of the ultimate conjunct joined to the point that it’s a unison pitch, [sings]. So I’d remember that just like this idea. So our closing theme, [sings] almost is the “woodpecker” idea. Sorry. But think of that kind of [sings] or maybe even a machine gun — whatever sort of silly analogy you want to construct to help you remember that. Okay. So here we are almost at the end of the exposition. Let’s listen now to the end of exposition and then we’ll stop. [music playing] Okay. So we’re going to stop there. Now on this recording what do you think? Well, I think — reasons for time — let’s go ahead and we’ll advance it up to the beginning of the development section. So now we should listen to this whole complex once again, but we’re not going to do that. We’re going to proceed here and we’re going to go in to the development section. And it’s kind of fun the way Mozart starts the development section here. [plays piano] Let me ask you this. We started here. [plays piano] The development begins higher or lower? [plays piano] Yeah? Professor Craig Wright: Now he is all the way — first of all, what’s the answer to the question? Which theme did he use here? We’re now at the re-transition, we’re almost finished this short development. Which one did he use? Who thinks they know? Raise your hand. Elizabeth? Professor Craig Wright: Used just the closing theme [sings] so nothing but the closing theme in this short development section. Now we are at the re-transition and you’re going to hear the violins come down [sings] but if I could sing the harmony — Maybe we should all sing it together. We’ll be singing [sings]. It’s the implied bass line. [sings] Then it’s going to go [sings] back to the tonic. Then we’re going to go [sings]. Then that first theme is going to come back in here. So let’s listen to Mozart write a re-transition, and I’m going to sing the implied — or then sounded dominant that’s going to lead to the tonic. [music playing] [sings] So all of the first theme material coming back — nothing new. [music playing] Here goes our bridge now — movement. [music playing] And he just cut it short. The first time he went there [sings]. That was what the bass did. This time he just stops the thing and stays in the tonic key. And then the rest of the material will come back in in the proper order in the tonic key. All right, but we need not hear that. Let’s go on now to the coda and we’re just going to listen generally to what happens in the coda here — typical coda with Mozart. [music playing] Tonic. [sings] [music playing] It’s almost stereotypical. Right? [plays piano] You could have written that. I — even I could have written that — not so hard, but as they say, it’s just a load of bricks to bring this thing to a conclusion. But it’s a beautiful example of sonata-allegro form. It does what our model requires in all particulars in an unusually rapid rate here — about six minutes for this particular movement. Let’s go on to a rather — another famous example of sonata-allegro form, and that’s the beginning of your own Beethoven’s Fifth Symphony, Symphony number Five. We, of course, worked with this before and you know the beginning, but let’s listen to a bit of this and we’re going to follow it through now all the way to the — into the exposition and development in terms of form — not some of the issues we were working with before, but in terms of form. [music playing] So no introduction — just starts off with his first motive there, a four-note motive. [music playing] And now the bridge is going to start. [music playing] You get a sense of moving from point A to point B or from first theme to second theme. [music playing] Okay. So we’ll pause it there, and the horn sort of says [sings] [plays piano] “yes, this is the end of the bridge,” something like that. This is the end of that, and then a new lyrical theme will come in. [plays piano] What interests — always interested me here, sort of like the “Jaws” movie. You never know when it’s safe to go back in the water. You’ve got this nice melody of [sings] but underneath you have [sings]. Sort of lurking under there is this pernicious four-note motive. A couple of points — note again — sort of breathe the air of this particular performance. Ah. Okay? It’s because we’re going to change to a different recording now. Let me comment on the closing theme. Notice how in this symphony Beethoven once again is obsessed with this four-note motive. We heard it underneath [plays piano] and at the end how does he create a closing theme? [plays piano] Well, [plays piano] just coming down an arpeggio — just taking that triad. [plays piano] Is this a major triad or a minor triad? [plays piano] What is it in relationship to the opening tonality? It’s the relative major. Okay? So it just goes from, [plays piano] up to [plays piano] short, short, short, long, so everything’s sort of short, short, short, long. All right. So that’s how he constructs the closing theme — just a different configuration of that short, short, short long motive. Let’s go back now and hear a different recording and tell me what you think about this recording. How does it differ from the preceding one that we were listening to? Let’s start with the repeat of the beginning if you can get there, repeat of the exposition, that — [music playing] Perfect. [music playing] Okay. Any thoughts about that? Just on one playing I know it’s hard. I should sit the two up here and play this one four times and this one four times, back and forth. What about this one though? Yeah. Professor Craig Wright: [music playing] Okay. That’s probably enough of that. Let’s go on to the development now. Development — well, how does the development of this symphony start? Which theme is he using? Well, you can imagine. Professor Craig Wright: [plays piano] His four-note motive [plays piano] [inaudible] [music playing] — then rather quickly [plays piano] he modulates through different keys. Every time you hear the strings sweep [plays piano] — we’re moving to a new key and then [plays piano] modulating to a higher key there. Then he begins to build up — begins to build up in terms of pitch, [plays piano] taking it up higher and higher and higher, and then we get [plays piano] that sort of sound. Well, first of all, let’s talk about this chord. What do you think about that chord? [plays piano] Full of tension, dissonance? Yeah, it has a lot. It’s called a diminished triad and we have put this up here. Remember we’ve had major triads, with major third in the bottom, a minor third on the top. And then we had minor triads. But what would happen if you constructed a triad with just a minor third on the bottom and then another minor third — two minor thirds? Well, you get this sort of more dissonant sound, [plays piano] a more biting sound. So that’s what Beethoven is using here, this dissonant [diminished] triad. There is another thing that’s quite interesting and that is that — this idea of just pounding away on one particular chord, this sound, [plays piano] that sort of thing. Beethoven started doing this. Did you ever have your CD player get — [plays piano] It drives you crazy, right? Why is he doing this? So think about how the audience of that time would have perceived this. The — what did the Germans of 1808 think? “Ludwig, Ludwig, was tun Sie hier? Dies ist nicht die Musik. Sind Sie wacklich? Hier ist die Musik.” [plays piano] — and so on. So this is a — this kind of thing — [plays piano] It’s almost like that kind of thing they used to use in old silent movies and then they tied her up [plays piano] and then they lit the fuse [plays piano] and then [plays piano] they’re building up tension. If you take this diminished triad and keep placing it at successively higher degrees of the scale, you get this extreme of tension, and what’s he done in terms of note values here? Well, we have this [plays piano]. It’s almost as if he’s stripped it down to just one note — sort of reduced it to its most elemental, and I — well, I could give you metaphors about taking matter and reducing them down to some sort of their densest potential and atomic explosions and things like that, but [plays piano] that’s kind of what he’s done here. He hasn’t expanded in the development section. He’s contracted, sort of to maximize the rhythmic energy — the almost electrical energy inherent in this particular concept. Well, all right, so then he backs off of this [plays piano] and gets sweeping [plays piano] and then he starts playing around with just two notes. [plays piano] Why two notes? Well, his original theme [plays piano] had just two notes in it, and then he breaks it down to just one note, once again reaching for the essence here. Now this might not sound like one note, but here’s what he’s got. [plays piano] That sounds like high, low, high, low, but if you stop and think about it [plays piano] they’re just coming down an octave, so he’s really just working with one note here. [plays piano] And then he changes it [plays piano] and then the theme [plays piano] [sings] but the diminished chord won’t let it in. [plays piano] He just sort of keeps repeating that one- note idea, high, low, high, low, high, low [plays piano] — “please let me in,” and finally this sort of insistent motive [plays piano] just breaks down the door [plays piano] and then the recapitulation can begin [plays piano] — and so on. The recapitulation begins at that point. So that’s the development section of the Fifth Symphony here, first movement of the Fifth Symphony, where he puts this electrical moment right in the — smack in the middle of the development section — in the middle of the movement — and then we get to the recapitulation. So we’ve heard some music of Leonard Bernstein’s interpretation of this. We’ve heard Bernard Haitink’s interpretation of this. Now let’s go on to — as you go out, you can use this as kind of exit music, a silly — a bit of silliness here — the Bee Gees’ interpretation of Beethoven’s Fifth Symphony.